The Hull-a-Port allows boats to be cradled securely on their side, making it easier to load and beneficial for kayaks of more delicate construction. Its stable, space-saving design keeps the kayak firmly secured on top of the car. Its padded bars keep the kayak from being damaged during transportation. 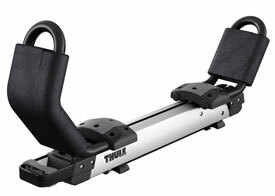 The Hull-a-Port Pro is the foldable version of Thule's successful Hull-a-Port angled kayak carrier. When not carrying a boat the upright section of the kayak carrier can be folded down so that it is not necessary to completely remove the carrier when passing under height restrictions. 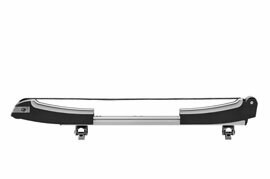 The Thule Hullavator Pro 898 is a kayak carrier that features gas-assisted loading struts that extend over the side of your car saving you to struggle lifting your kayak on to your roof rack. The Thule Portage carrier is a set of 4 padded load stops designed to securely carry your canoe on your roof rack. The load stops can be easily adjusted to fit the width of your canoe and eliminate any sideways movement. Stand up paddle board carrier with a telescoping design that delivers a custom fit for board widths from 700-860mm. The Kayak Carrier is ideal the ideal way of carrying one boat. Perfect for larger boats or kayaks that are made from more delicate materials such as GRP, carbon fibre or diolen as the rubber pads protect it from scratches and marks. 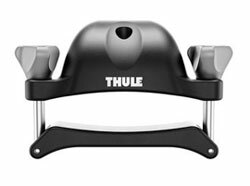 The Thule Hydroglide has two rear pads covered in microfibre allowing you to simply silde the boat up onto the car roof. The felt lined rear supports allow the boat to slip over them and onto the front rubber pads which securely grip the boat. The Canoe Carrier is an excellent way to secure your canadian canoe and eliminate any sideways movement when your canoe is strapped to the roof. Standard padded upright kayak bars for transporting kayaks on their edge. Simple design that bolts around your roof rack. Standard padded J Bars for transporting a kayak on edge in a cradle style J bar. Simple design that bolts around your roof rack.